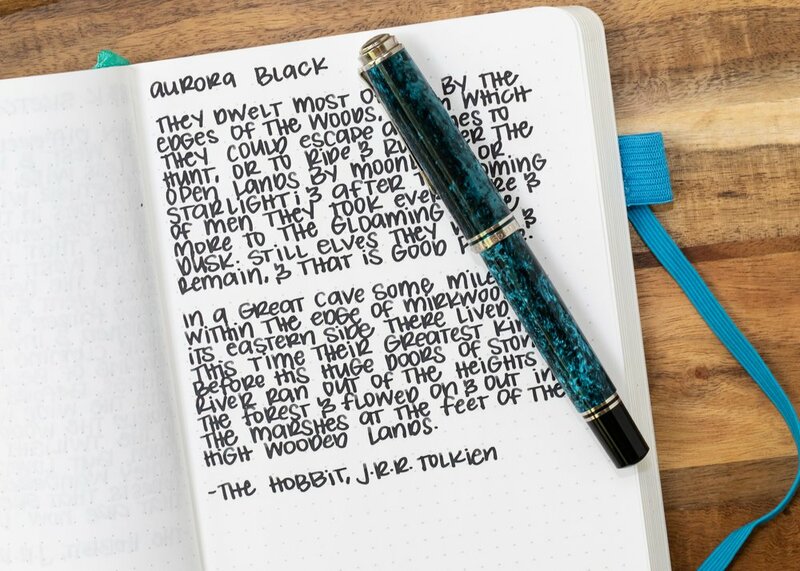 Let’s take a look at Aurora Black. I have heard about this ink from a million people who love it, so I finally decided to give it a try. I purchased my sample of ink from Vanness Pens. Black is a great basic, dark black, very saturated. In large swabs there is just a little bit of sheen. Other properties: no shading, low sheen, and no shimmer. On Staples 24 lb copy paper there was just a little bit of feathering, and some bleeding in the flex nib. 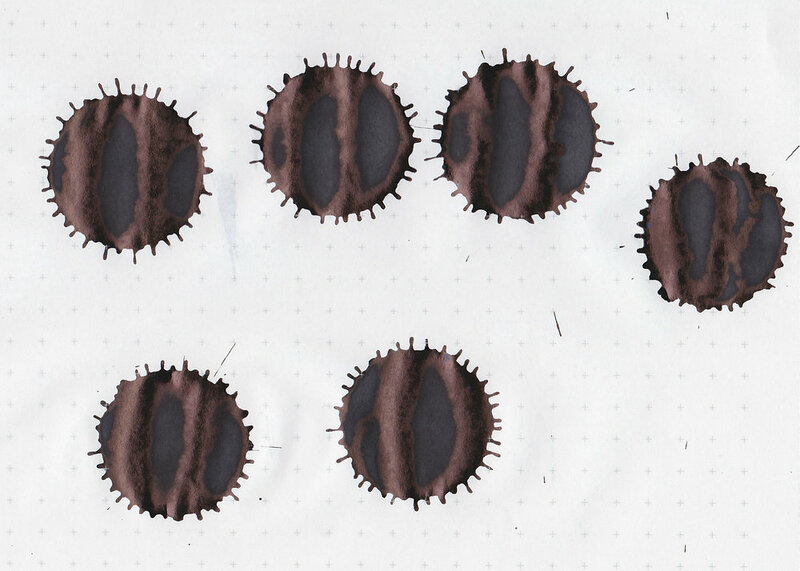 Ink swabs for comparison, left to right (top to bottom for mobile RSS): Colorverse 1 Sunspot, Aurora Black, and Sailor Jentle Black. Click here to see the Aurora inks together. Diamine Onyx Black, Pilot Iroshizuku Take-sumi, and Pelikan Edelstein Onyx. Click here to see the black inks together. I used a broad Pelikan M805 Ocean Swirl on an ivory Hippo Noto Notebook. 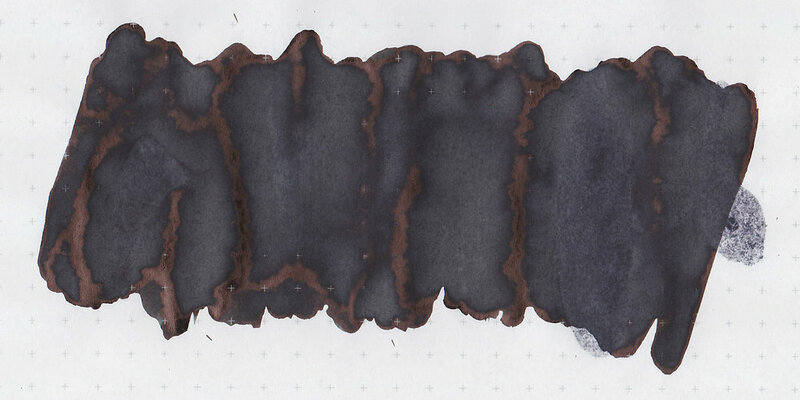 The ink had a wet flow. Overall, it’s a great basic dark black. It is a bit expensive at $18 for 45ml, but has a nice wet flow. I added a full bottle to my wish list, since I love it as an everyday black. Disclaimer: I purchased this ink myself, and all photos and opinions are my own. This page does not contain affiliate links, and is not sponsored in any way.